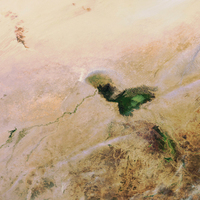 Lake Chad, one of the world’s largest lakes, has been shrinking dramatically since the end of the 1960’s. Climatic parameters, unregulated water exploitation for irrigation farming, as well as high population pressure, have all contributed to the lake shrinking to 10 per cent of its former size. Two thousand years ago the size of the lake was comparable to the size of Germany, and was the most important source of drinking water for the caravans. Satellite images of the area have been drawing unprecedented attention to the dramatic decline of water levels during the last decades of the 20th century.